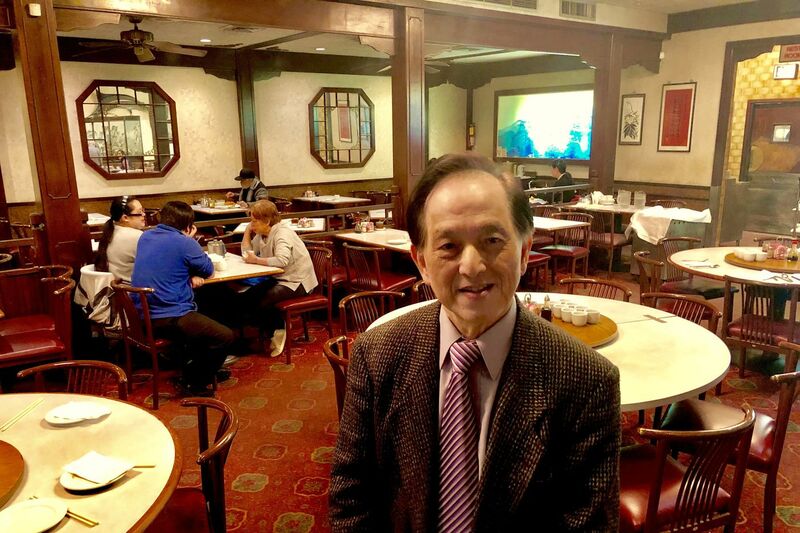 Daniel Law, 69, son of one of the founders, has helped manage Imperial Inn in Chinatown since 1987. Imperial Inn, arguably the oldest restaurant in Chinatown, will close Sunday after lunch, capping more than 45 years of Cantonese cuisine prepared by cooks so seasoned they could have taken their orders from General Tso himself. Four men from Hong Kong founded the Imperial in 1973 as a small restaurant at the northeast corner of 10th and Race Streets. Six years later, they remodeled a double-wide storefront down the block, at 146 N. 10th St., and moved there, picking up a large dining room beyond a sidewalk canopy, and a second-floor banquet room that hosted countless weddings, Sweet Sixteens, and bar mitzvah parties. Why does Janeane Garofalo want to play a 50-seat theater in Chinatown rather than a bigger comedy club? Is Philly soda tax solely to blame for closing of West Philly ShopRite? In its day, Imperial Inn was a politico and celeb hangout. A dinner visit in 1980 by Pete Rose and Morley Safer of 60 Minutes was covered in the newspaper. In the late 1990s, cable titans Ralph Roberts and H.F. “Gerry” Lenfest hashed out details of Comcast’s acquisition of Lenfest Communications over lunch. The service bar at Imperial Inn, which opened its location at 146 N. 10th St. in 1979. Operating partner Daniel Law maintains a wall of photos, most dating to the 1980s and 1990s, bearing the smiling faces of then-Mayor Ed Rendell (holding a takeout bag), New Jersey Gov. Christie Whitman, a Chinese president, wedding parties, and everyday customers and their children. The site will become a supermarket, said Law, 69, as always in a jacket and tie, a chatty, slight fellow who described himself as “the young man” among the four owners. He started at the opening waiting tables for his father, Chen Lam Loo, an original owner. Law assumed his father’s share of the business after his death in 1987 and became a general manager. Others, including Luis Sust, 82, the next-youngest, own the other shares. The death of Law’s uncle Kit Fon Law, who worked till the day he died at age 94 several months ago, helped prompt the partners' decision to sell. Law declined to identify the prospective buyer. The main dining room at Imperial Inn toward the end of lunch service on Jan. 22. Pragmatism factored in, too: “We are getting old," said Law, who with his wife, Bo, lives around the corner from the restaurant. Their son has a corporate job and does not fancy a life of running a restaurant. Asked if he minded the aggravation, Law laughed and said: “I built it into my body. But after 46 years, I think I’m burned out.” He said he would retire to travel with his wife, fulfilling a promise to her. Customers filed into of the restaurant Tuesday, passing the entryway with its gumball machines and rows of plastic flowers and settling into the wide open, red-carpeted dining room, which sits beneath crystal chandeliers partly recessed into the ceiling. Backlit photos of Chinese scenes create a glow against the walls. Wooden tables are topped with Lazy Susans, as banquet-style meals are the way to go. Prices were reasonable, topping out at the teens. At the bar, a mai tai set you back $6.95, a Manhattan $5.50. Customer Joe Hoffman said his children, now in their 20s, started coming to the Imperial as infants. “And everybody in city government,” he said, praising "the food and how the help here go out of their way to serve you and educate you on the menu . The Rev. Ronald McCoy, who preaches in Wynnefield and Louisiana, had what he said would be his final lunch Tuesday. He credited staff for educating him about Chinese food and praising the “respect and decency” that workers have for people of all walks of life. “They went to the trouble of learning your name,” he said. Though Chinese-owned businesses have operated in Chinatown since the 1870s, the neighborhood only emerged in the mid-1960s as the residential and commercial district it is today. Other long-running restaurants include Lee How Fook (1978), David’s Mai Lai Wah (1980), and Joy Tsin Lau (1982). Imperial Inn, which opened its location at 146 N. 10th St. in 1979, has a second-floor banquet space.